The fact that your cat is overweight is evidence that they’re eating the wrong food. Regardless of what life with 21st-century housecats might lead you to believe, cats aren’t supposed to be overweight. Naturally, cats are high-performance predators—lean, sculpted, and fast. We’ve taken cats out of their natural environment, protected them indoors, and fed the vast majority of them a diet of meat-flavored cereal. Under these human-dictated conditions, cats become overweight, under-stimulated, over-sugared, and at risk for serious health conditions. For better or worse, your cat relies on your dietary choices—that’s why it’s critical for you to know how to choose the best food for your overweight cat. Here’s how to pick a great cat food for weight loss. From their claws to their metabolism, your cat is designed to hunt and eat animals. Because their prey is no more than 10% carbohydrates, cats have virtually zero carbohydrate requirement. This is in conflict with many conventional feline weight loss diets. In order to keep calories low, they decrease protein and fat, while bumping up levels of carbohydrates and fiber. These diets are wrong in multiple ways. By restricting protein intake, they may cause muscle loss. Secondly, because your cat is an obligate carnivore, they’re hardwired to feel satisfied by protein and fat—not carbohydrates. This means that while these diets are low-calorie, they’re not as satisfying as diets rich in the protein and fat your cat instinctively craves. To maintain healthy muscle mass and keep your cat satisfied, honor your cat’s natural dietary needs. The ideal weight loss diet is one that’s high in protein, moderate in fat, and low in carbohydrates. Is dry or wet cat food better for weight loss? In short, wet food is better. Here’s why. Like breakfast cereal, kibble cannot exist without carbohydrate binders. Premium Wet food, however, is almost universally high in protein and made with minimal amounts of carbohydrates. Furthermore, high-moisture cat food is bulkier and will help your cat to feel full longer. 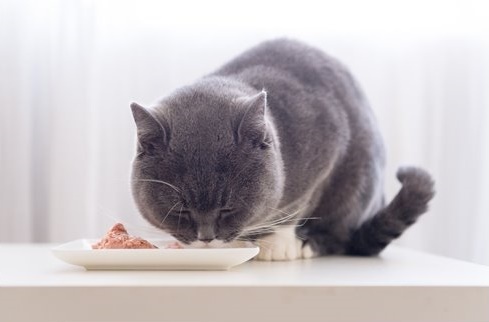 The switch to wet food might be a challenge, especially if your cat has eaten kibble since they were a kitten, but in the long run, wet food will keep your cat full longer and help them to lose weight with less of a struggle. 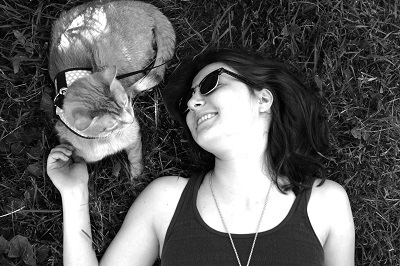 How much food should you give your overweight cat to lose weight? Your cat should lose weight at a slow, steady rate of about 1-2% of their current weight each week. According to this weight loss rate, if your cat currently weighs 25 lbs, they should lose between 4 and 8 ounces during their first week of dieting. Free-feeding is out for overweight cats. Allowing your cat to freely nibble from a full bowl of food might seem to honor their natural instincts, but few things could be less natural for a cat. Cats naturally eat multiple small meals throughout the day, fasting between each successful hunt. In addition to discouraging your cat from gorging themselves, feeding multiple meals during the day will allow you to closely monitor your cat’s intake. Assuming that your cat is currently maintaining an unhealthy weight, determine the number of calories they eat now and gradually cut back to 60-80% of that amount. If you don’t know how much your cat presently eats, try one of the other two methods. The following formula will give you an estimate of your cat’s maintenance intake at an ideal weight. The variable “W” represents your cat’s weight in pounds. If your cat’s ideal weight is 11 lbs, then their maintenance intake will be roughly 220 calories per day. When your cat is eating for a slimmer body, they’re living with a calorie deficit. This encourages gradual weight loss until your cat reaches their goal weight. If you’re not someone who likes numbers and rules and calculations, you’ll probably prefer a common-sense approach to weight loss. Just feed your cat less until they’ve reached a healthy weight. Remember that a highly-satisfying, moisture-rich, high-protein food will help you out here. NomNomNow is the only cat food company that pre-portions each meal based on your cat’s weight goals and delivers it fresh to your door. 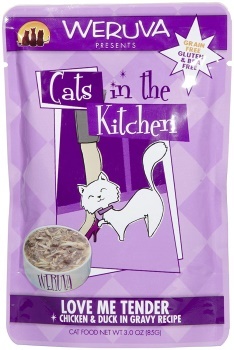 and one of the best cat food for overweight indoor cats on the market today. When you set up your account with NomNomNow, you’ll enter your cat’s current weight and weight goal, along with any other dietary needs. Based on this information, the NomNomNow team measures out portions that support your cat’s weight goals. Each batch of cat food is made-to-order in the company’s own kitchen. 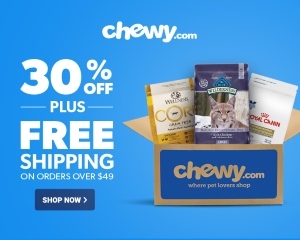 Because it’s fresh, moisture-rich, and full of species-appropriate animal protein, this food is a satisfying and nourishing choice for overweight cats. 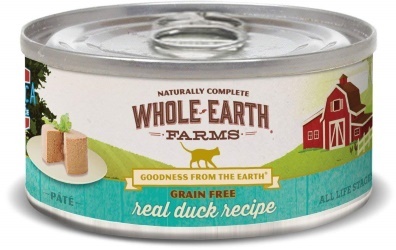 This is a limited-ingredient food designed for cats with food allergies and intolerances. 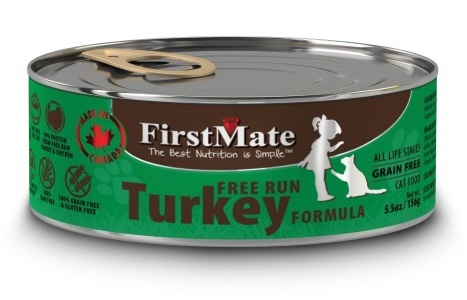 Its ingredient list emphasizes species-appropriate protein from poultry making it one of the best canned cat food for weight loss available. Overall, 96% of the food’s protein content comes from animal sources, with the remaining 4% from plants. Although it’s a meat-heavy food, the recipe includes potato, which isn’t a desirable or necessary inclusion in wet cat food. The food has approximately 78% water content, so it’s moisture-rich and satiating. According to some reviewers, it’s on the soft side, making it easy to eat if your cat has any dental problems. While it’s low in calories, this recipe emphasizes high-protein animal ingredients like chicken, chicken liver, chicken meal, and turkey. Unfortunately, the recipe also contains pea protein and dried ground peas, which aren’t ideal for an obligate carnivore like your cat. Each can is around 12% carbohydrate on a dry matter basis, making it slightly more carb-heavy than the ideal feline diet. 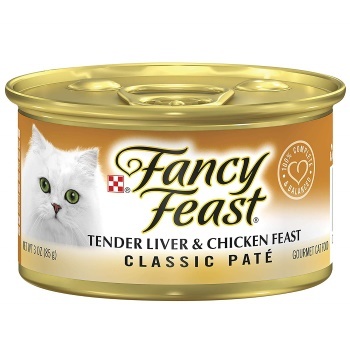 If you want to slim your cat down on a slim budget, this formula from Fancy Feast can help. Canned food from the grocery store is usually just as good or better for weight loss than food from premium brands. If your overweight cat was previously eating dry food, the switch to any high-moisture, low-carb food will make a big difference. You’ll notice that almost all of the meat ingredients in this food are vaguely-named, indicating that they’re by-products and less strictly regulated than food-grade meat for human consumption. While meat by-products aren’t always as highly-digestible as select slices of muscle meat and high-value organs, they’re species-appropriate and will help your cat to maintain muscle mass while losing fat. This food gets virtually all of its protein from meat and doesn’t have any of the high-carbohydrate ingredients your overweight cat needs to avoid. Each can is just .8% carbohydrates – such a low percentage is ideal for weight loss. This is species-appropriate nourishment in a satisfying format, and it’s affordable for almost every shopper. Of all the products on this list, this formula from Weruva has the fewest calories per ounce. It is just 20.6 calories per ounce and 62 calories per pouch. 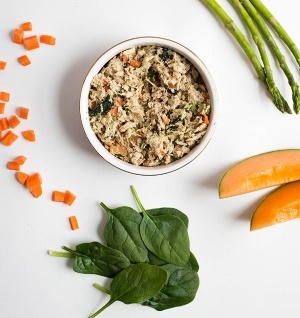 This simple recipe features shredded chicken and duck in gravy, making it a good choice for cats who prefer chunks and shreds of minimally-processed meat. It includes water as the first ingredient, meaning that the low calorie density is largely thanks to the food’s unusually high water content. Because it emphasizes animal protein, this food will help your cat to maintain lean muscle mass while gradually losing weight. While it’s low in calories, this hydrating food is packed with protein and will help your cat to maintain lean muscle mass throughout their weight loss journey. 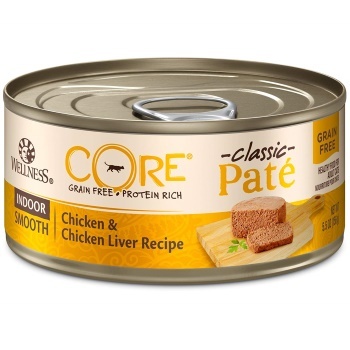 It’s a pate-style food and, according to most customer reviews, highly palatable for cats. Unfortunately, the food also contains a small amount of dried alfalfa meal, which contributes to the amount of minimally digestible plant protein.